If you don't visit any other Greek Island, make sure you go to this one. We can NOT say enough good things about Milos island. Honestly, it's one of those places that we loved so much, we almost don't want to share it with anyone, but also, it's SO amazing that it feels like we have to. 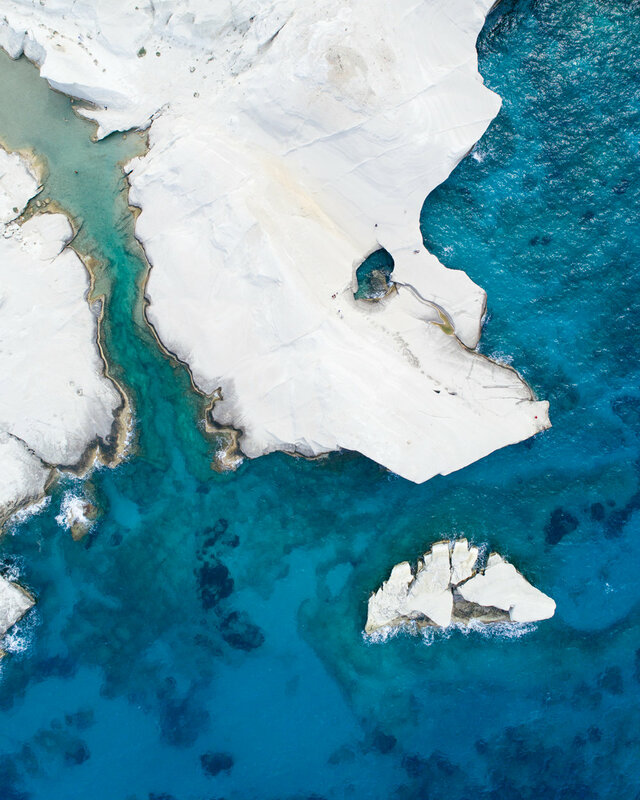 Milos is probably our favorite island on earth. We were there during low season, so it felt like we had all of the incredibly stunning natural beauty to enjoy all to ourselves. It was seriously a slice of heaven on earth. I'm pretty sure if we could've stayed forever, we would have. We actually tried to come up with ways to stay there forever. Or at least move there and live there forever. It's actually still on the table, haha. Honestly, Milos doesn't have much. There aren't a lot of restaurants or tourist activities, but that's part of what makes the island so magical! You can easily entertain yourself for hours, because it's like a giant natural playground. We rented ATV's and drove around the entire island. We seriously had almost every beach to ourselves, and it felt like heaven. Have I already said that? There are countless caves to swim through and cliffs to jump off of and plenty of perfect blue sea water to float in. Our favorite beaches in Milos were Sarakiniko Beach, which was created by white volcanic ash, giving it the most unique moonscape, and Papafragas Canyon, which is basically this stunning canyon that you can swim all the way through. The water in Milos is the most incredible shade of blue. It's like the perfect mix of deep sea blue with bright light slushie colored blue (sorry, that's the only thing I can think of to compare it to, haha). On the other side of the island, the best beaches are Tsigrado, Fryiplaka, Provatas, and Paleochori. Be careful going to Tsigrado, because in order to get there, you have to go down a steep cliff that takes you to an old wooden ladder in the middle of two giant rocks. It's honestly kind of scary, but it's so worth it when you get down there. We had the entire beach to ourselves, and it was so serene and peaceful! Fyriplaka, Provatas, and Paleochori are pretty close to Tsigrado, but much easier to get to, which also makes them a bit more popular. It was too windy when we were there to go on a boat tour, but if the weather's right, make sure to take a boat tour to the beautiful grottos (and old pirate's hideout) of Kleftiko. We also loved watching the sunset from the little neighborhood of Plaka and eating dinner in the port city, Adamas. If you're heading to Greece soon, be sure to book a ferry to Milos! You will not regret it. And if you're looking for a place to stay, Salt Milos is truly the absolute best! 20 Photos to Inspire You to Sail Around Croatia.